The platypus is the ultimate evolutionary mashup of birds, reptiles and mammals. The iconic, egg-laying, venom producing, duck-billed platypus first had its genome sequenced in 2008, revealing its unique genetic makeup and its divergence from the rest of the mammals around 160 million years ago. 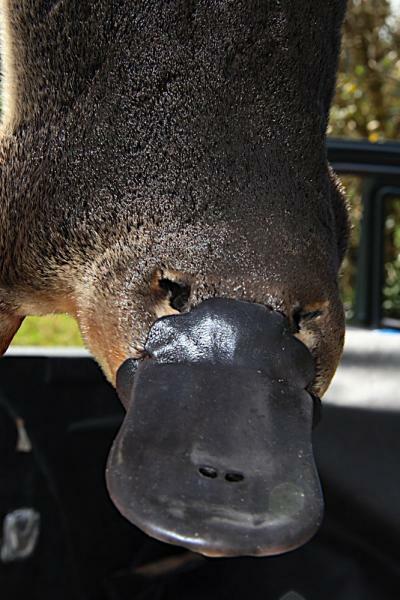 Now, a greater effort to understand its ecological and population history has been made possible by the first, whole-scale genome sequencing efforts of 57 platypuses across Eastern Australia and Tasmania. The work was led by researchers at the Wellcome Centre for Human Genetics, University of Oxford and the Sydney School of Veterinary Science, University of Sydney, and published in the advanced online edition of Molecular Biology and Evolution. They were able to establish a platypus family history and kinship in a level of detail not previously sampled. "We have described the first population-scale, whole-genome sequencing study of the platypus," said Dr. Peter Donnelly from Oxford. "Our analyses provide insights into the population structure and levels of diversity in this species not previously possible and estimate the relatedness between individuals." "For example, we found that more than half of our samples had a least a third-degree relative amongst the other individuals sampled from the same river. Additionally, there were 26 pairs of second- or third-degree relatives, in all cases from the same river or creek, or closely connected waterways, involving 28 of our 57 samples." The research team was also able to estimate vital evolutionary forces at work including platypus mutation rates, divergence times, and population sizes throughout its history. Dr. Hilary Martin, one of the lead authors of the study also from the University of Oxford said: "We estimated the de novo mutation rate in the platypus, the first estimate in a non-placental mammal." They found it to be middle of the road for mammals, lower than humans and chimpanzees but higher than laboratory bred mice. "The relative ordering of the point estimates is consistent with the observation that mutation rates in mammals are negatively correlated with body mass and generation time," Dr. Martin said. The study also estimated that the platypus population most likely last shared a common ancestor nearly 1 million years ago. Dr. Jaime Gongora, from the University of Sydney, said the deepest branch on the population tree separated three separate groups: the samples from Tasmania (an island to the south of Australia that separated from the mainland around 12,000 years ago); those from north Queensland (in the far north); and the remaining samples, which are from central Queensland and New South Wales. "We think it is most likely that there were three ancestral populations (Tasmania, North Queensland and North New South Wales/Central Queensland) which all coalesced around the same time, about 800KYA," said Dr. Gongora. "The central Queensland samples likely shared an ancestral population with the North New South Wales samples about 300KYA. This implies that there has been extensive population structure in platypus samples across Australia over a long time period." Dr. Donnelly commented: "Interestingly, the divergence times we have estimated predate the earliest fossil evidence for platypus." "This finding does not necessarily contradict fossil evidence but suggests that the modern platypus extends back to the Early to Middle Pliocene. This could be consistent with it having evolved from the giant platypus species, O. tharalkooschild," Dr. Donnelly said. In addition, researchers found evidence of past population bottlenecks, particularly in North Queensland around 10,000 years ago, and identified modern populations (especially near the Carnarvon River) that would be aided by conservation efforts. The Queensland bottleneck likely reflects the historical and current isolation and paucity of suitable habitat for platypus between North (Australian Wet Tropics) and Central Queensland, known as the 'Burdekin gap' (named for the Burdekin River). Dr. Gongora concludes: "This hot and dry area is currently climatically unsuitable for platypus and has long acted as a barrier to genetic exchange." With the new genome data in hand, future studies will continue to explore the population history and unique biology of the platypus. And given concerns about the impact of climate change, disease, and other factors on platypus populations, their better window into past responses of platypus populations may help to improve conservations efforts.